Clipping can really screw up a photo. As you make adjustments to a developed image, its possible to clip data (essentially create a loss of detail in the shadows or higlights). Crush the whites or blacks in an image and you’ll lose important areas and range. Sure, the problem shows up most when you print, but it can still really screw up an image. Fortunately, Photoshop and Lightroom can warn you (if you turn on an important option. Doing this will turn on clipping warnings. You can also just click on the triangle icons. In the Histogram display, you’ll see two small triangles. You can click the one on the left for shadows and the one on the right for highlights. When enabled, clipped shadows appear as blue areas in an image. Look near the top of the palm tree in the image above. Any highlights that are clipped appear in red. Highlight clipping will warn you if any one of the three RGB channels is clipped (fully saturated with no detail). Shadow clipping will warn you if all three RGB channels are clipped (black with no detail). If you really want to see the problem, hold down the Option or Alt key as you develop the image and drag sliders. You’ll see a black or white area and the clipping will pop with a color warning. The colored areas show you where clipping is occurring as you drag a slider. 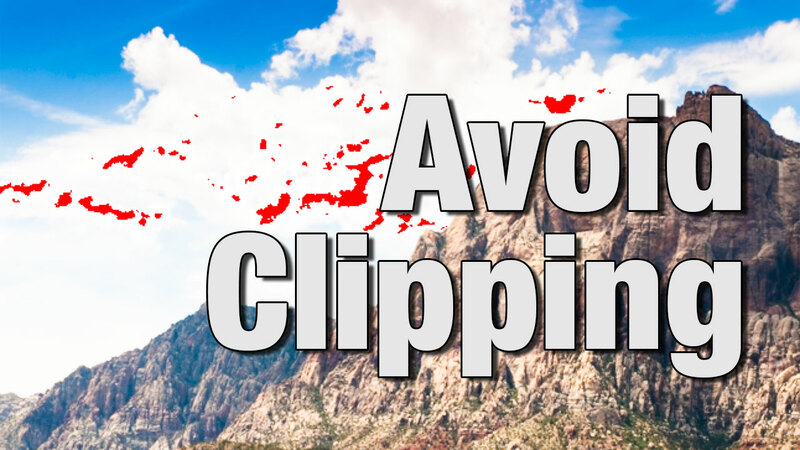 When clipping occurs, try to reduce the intensity of the adjustment in that area.